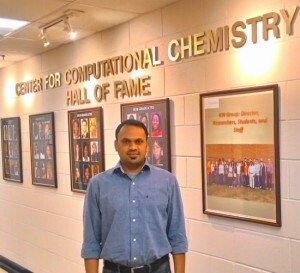 Juganta Roy is featured in the National Science Foundation’s “Experimental Program to Stimulate Competitive Research,” spotlight. Roy is a doctoral student under the direction of Dr. Glake Hill in Jackson State University’s Department of Chemistry and Biochemistry. His areas of research largely focus on molecular dynamics simulation of polymeric materials, electronic structure calculation of metal-oxide surface and metal/ligands interfaces, quantum chemical calculations, quantitative structure–property relationship (QSPR) analysis, and design of photovoltaic devices. Roy has a special interest in the understanding of the nanomaterials phenomena from a theoretical perspective and in close collaboration with experimentalist. His current project, Molecular Dynamics Simulation Study of Polymers and Bio-polymers, focuses on the designing of new dyes for the dye-sensitized solar cell based on QSPR and first principle approach.